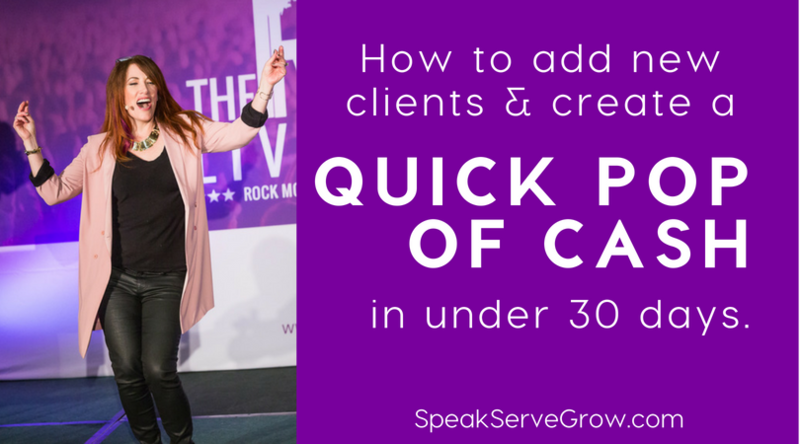 So I have a new group of coaching clients joining the Rock Your Talk & Biz Club & it got me thinking about how to create a pop of cash in your business. Because sometimes you just need a boost! Or you’re ready to break a revenue record for your business! Or you want some money for something special in your life. And revenue boosts are also helpful if you’re just made a big decision to invest in something to grow your business. That’s 100% awesome! Let’s go rock a little cashola your way! Alright, so how do we create a pop a cash in your business? The best way to put some on bumpin tunes, and get into action! It’s way too complicated. It’s going to cost you a lot of money & time. So we want to keep whatever the thing is that you’re going to do to generate your income… really simple. So that’s rule number one. Start letting your mind wander to things you can offer that you already have done or can do without going too far into “creation mode”. Consider ideas like one new private coaching or consulting client. Consider selling a few VIP Days. I’d love VIP Days as kind of a quick pop of cash. If you’ve never done one before that just means imagine working with one person & you might hunker down in a room for the day and really knock some stuff out. (Often Mapping Out a Strategies or Plans & Done For You Services are a good fit). Your VIP DAYS could be in person for the day. Like I have clients that fly into Portland for the day. And VIP DAYS can be virtual. So if it was your Virtual VIP Day, depending on what you wanted & needed of course…we might Uncover Your Brand Personality, Create Your Talk / Webinar Outline Structures to Sell, Craft a Rockin Entry Level Offer to Make During Talks & Webinars & Lastly Understand How to Use On Brand Marketing Materials Generate More Sales at Talks & Events. Again a VIP day is a great offer where you just go in-depth with one person, and often you’re creating like a whole plan and a strategy. If you were a health coach: You might assess where the person’s health is at. Clean out their kitchen of all that sugary & processed foods. Figure out a plan to get you moving. Etc. If it was a wealth creation VIP DAY you could assess a person’s finances and goals. Create a plan to eliminate your debt. Reconfigure the savings plan so its automated. Imagine the progress you could make in one day with somebody! So awesome. I always think of a VIP DAY as equivalent to three to six months of progress in a single day. So that’s a great offer when you’re looking for a pop of cash. It’s short terms, and delivers BIG IMPACT for your clients. You could just be looking for private clients. Also fine! You could have a workshop coming up. I’ve a few clients who have a workshop or a retreat coming up in the next few weeks. Let’s get some butts in seats! These are simple, short-term pops of cash ideas that we can generate that don’t require you creating fancy systems or funnels or launch sequences or anything like that. Look for simple ways to make your offer. We’re not trying to set up complicated systems and launches and get 93 partners. Instead you’ll want to think of the simplest ways that you could offer it to people. And what I’m going to say next is going to sound deceptively simple so don’t overlook it. I get it it sounds lame but trust me. So when I first hired a coach I wasn’t even in the training program yet, but I found this video floating around somewhere and she gave this tip (send an email) and I did it. And I got TWO PRIVATE COACHING CLIENTS. “I’m looking for three amazing __people you serve__ who want __(result you give)__! Have a “Call a to Action” in your email. Please know that your call to action doesn’t have to be sending them to a sales page. Again we’re steering clear of complicated. You do not need to create a complicated way for someone to raise their hand & say yes to your offer. Always remember that. Remember every email, every tip you send in this short sequence needs to be speaking to & relevant to your most ideal client for the offer you’re going to make. Teaser Email #2: Recap the big problem, where you left off with you hanging off the cliff… and now share the high-level solution (this is the THING you do for people/how you help clients). Think of sharing the high level steps or strategy more than details. Teaser Email #3: Recap the Blue Sky/Big Dream that’s possible for your clients & share a tip, tool or free download to help them get started getting results. Offer Email #1: Share another tip or roadmap of success, and then offer people the experience of you walking them through this in a totally customized way and invite them to take action. Offer Email #3: This ‘last call’ message should talk about what holds people back (here’s a few common concerns that might be holding you back from taking action), and should be rally cry for finally solving this problem and getting the help they need from you. Remind of the deadline and how to say ‘yes’. Easy peasy! Pop up your phone on, & start connecting with your tribe, but don’t just sell, always serve first. So simply take the email sequence above and talk it out loud! Woohooo! Now you’re rockin! In this case, your call to action can be for people to comment with a phrase or private message you. Pick up the old telephone! So any time you’re going to start a new program. Make a Dream List or you could call it a wish list. Start making a list of the kinds of people you know, specific humans that actually exist on earth, that you would love to be in your program. This is what I do too! Make that wish list. You’ll shocked to find out how happy people are when you pick up the phone and tell them sincerely why you would love to work with them, the results that you envision for them, & where you want to help them go next based on what you know about them. It’s awesome. It’s so personal and it really doesn’t happen often. So people will appreciate that you cared enough to reach out, as long as it’s true and sincere. Okay rock star… time to get into action on some of these ideas. What offer are you going with? And how will you reach out? If you’re in my Rock Your Talk & Biz Group Coaching Club, there is a whole hour long training in the Training Library called Get More Clients and will give more ideas on how to boost your biz right away. If you’re not yet a client and you’d like my help beyond my more entry level information products, please message me and let me know you’d like to connect so we can rock your biz! Just need a place to get started? Try my flagship Rock Your Talk or Rock Your Workshop programs.